Browse the categories below to get the answers to our most frequently asked questions. Are your signs printed on both sides? Yes, all signs are printed on both sides unless otherwise requested. Where can I find product guides and installation instructions? You may click here to find various product guides and installation instructions. What if I need a custom size or shape that I don't see on the website? No worries! We are happy to help you with your custom orders. We manufacture a variety of custom sizes and shapes. Please ask your sales representative to assist you with your special size sign or frame requirements or complete our online quote from: Request a Quote. How large will the letters be on my sign? The size of the text will depend on the font and layout of the sign. The more text that's on the sign, the smaller the letters will be. Your sign proof will be proportional to your printed sign. For example, if your sign is 6" high and your lettering occupies about 2/3 of the height, then your lettering is about 4" tall. What materials can I choose for my signs? We have a big selection of materials to choose from. Click here to see our material options. We can print whatever color you want! You can choose one of the Oakley stock colors or you can choose from hundreds of PMS colors. Click here to see the color chart. Note: Colors shown on your screen and on the sign proof WILL vary from the actual printed color. You can request to have a printed color sample mailed to you before the signs are produced. Please contact us at 800-373-533 to request a color sample. Will my printed signs look exactly like the proof I approved? You will review the sign proof on your computer screen so the colors WILL vary from the printed signs. Colors on your computer screens are based on the graphics card and monitor used in your system. If I have an arrow on my sign, how can I ensure the arrow is facing the same direction on both sides? Leave it to us! We will automatically adjust the artwork so that the arrows are pointing in the same direction when viewed from either side. How long will my signs last? Actual sign life will vary depending upon usage, transporting, weather conditions, and many factors beyond our control. We cannot assume responsibility for weather conditions. As panels swing in the wind, are handled by sign installers, and are exposed to extreme weather conditions (i.e. snow, winds, hurricanes, hail, salt water, etc. ), there is a possibility the product will become damaged (i.e. holes ripping out, scratching, etc.) The expected longevity of each material is listed on the materials chart. Click here to see our materials chart. Do the signs come with a frame, stake, post or hardware? Posts, frames, stakes and hardware are sold separately. A complete list of posts, frames, stakes, and hardware can be found on our website www.OakleySign.com. When frames are ordered with sign panels, we will ship them assembled at no additional charge. Do the signs and riders come with holes to hang or attach them? Most signs and riders come with our standard hole pattern which is 4 holes on the top and bottom. The holes are 3/4" in from the top and bottom edge. If custom holes are needed, we can add additional holes or make a completely custom hole pattern. Custom holes are $.25 each. Click here to see our hole pattern chart. What is our product guarantee? Our guarantee is to provide signs that will have proper ink adhesion, be free of scratches upon delivery, and be in compliance with generally accepted industry standards. We stand behind our products and will immediately resolve any defects or errors that are caused by our company. Actual sign life will vary depending upon usage, weather conditions, and many factors beyond our control. We cannot assume responsibility for weather conditions. We cannot assume liability for weather conditions or improper handling and usage by the customer. Rusting of steel sign panels and/or steel sign frames WILL occur to any area that is chipped, worn or scratched. The time it takes for steel to rust is primarily dependent on its exposure to air and water. As for steel sign frames, this exposure can be reduced with the application of protective coatings. Steel rusts more quickly in salt water than in fresh water and accelerates more rapidly in coastal regions. These are not as a result of manufacturing defects. Yes, Oakley Signs & Graphics can help create your design. Click here for more information about our design services. Is your design service free? To learn about our specific design services, click here for complete details. Can I send someone at Oakley Signs & Graphics my art files? Yes, we can work with your art files. Click here for instructions on sending the files. What kind of art file do I need to provide? For the complete list of acceptable files, please click here. I want my photo printed on my sign. How can I do this? When you order a sign panel or rider, you will have the option to include your photo. When ordering online, you simply select the correct photo template and upload your photo when prompted. A general rule for sending photos is to send the photo in its original form as the digital camera created it. The original photo used determines the final output of your photo on the sign. Click here for guidelines for sending photos. Can I send a sample sign so Oakley can match the color? Yes, we can match color samples you provide. If you have a sample sign you would like us to work with, please contact us for shipping information prior to your order. How can I tell if an image is good enough to use? One way to see the quality of your image is to open it on your desktop and zoom in on it. If the image is pixilated or grainy it means it's a poor quality image. This is also how the image will look on your printed sign. The original image used determines the final output of your image on the sign. I see "Tuesday Tactics" mentioned on the website. What is that? As part of our "Free Help for Real Estate Agents" we offer a free email newsletter with information that will help you improve your real estate business. Sign up here. What are Oakley Signs & Graphics hours of operation? Our website is open 24 hours a day, 365 days a year! You can browse our products and services, or place an order online any time. If you need help, would prefer to speak with someone live, or contact our Customer Service Representatives, our team is available for you Monday through Friday, 9:00 AM - 5:30 PM (Eastern Time). Each team member is well versed in all of the products and services that Oakley Signs & Graphics has to offer, and are happy to help you with any question you may have. Please call for assistance at (800) 373-5330. I need help. How do I reach someone? The best way to reach the right person is to visit our Contact Us page. There you will find links to all the ways to best reach us. You may reach a customer service representative through our online "Live Help" feature, or by calling our main office at (800) 373-5330. What is the Oakley Signs & Graphics' Address & Contact Information? Click here for our addresses and contact information. How can I contact Oakley Sign Installation? How do I log on to the Oakley Signs & Graphics website? If this your first purchase with the Oakley Signs & Graphics website, simply select the items you would like and add them to your shopping cart. When you're ready to checkout, choose "Guest Checkout." Follow the on-screen prompts and add any required information. Click the LOG IN button shown at the top right corner of any page. Complete the selection of all items you'd like to purchase, adding them to your cart. When ready to check-out, choose "Returning Customer." What is the best way to purchase from Oakley Signs & Graphics? The quickest way to complete your order is on our website. Orders are accepted online 24-hours a day at www.OakleySign.com. If you have any questions, or would prefer to order by phone, you may call toll-free (800) 373-5330, between 9:00 AM - 5:30 PM (Eastern Time). I have a coupon. How do I use it? Every month, we include a special "subscribers only" discount coupon code within our free weekly newsletter, Tuesday Tactics (Click here to sign-up). When placing an order online or over the phone, you will be prompted to provide your coupon code. Simply provide the code, and your discount will be applied automatically. How long does it take for my order to be produced? We are happy to announce that we have the fastest guaranteed order turn around times in the country. Click here for complete details. Do you have a Rush Service? Expedited production is available for an additional charge of 35% of the printed portion of the order. This will guarantee your order to be produced 3 business days, or less. Expedited shipping is available and will be quoted based on current UPS rates. Please contact us for an expedited shipping quote. Yes, in fact we must have a signed approval before we can begin production on any order of customized signs. Proofs will be produced in 24-48 after order is placed. Agent riders placed online will not have a proof prior to production unless requested. We provide up to 3 proofs and revisions at no charge. Beyond three proofs, a fee of $25 per proof will be applied to the order. How do I know that Oakley has received my order and how will I get a receipt? When you submit an order online, you will receive an email with the Web ID number and total. Once the order is processed internally, you will receive another email containing the order number and an order receipt. If the order is placed on the phone you will receive an email with the order number and an order receipt. Note: it can take up to 24 hours (during normal business hours) for your order to be processed internally and for you to receive an email confirmation. What if I don't receive an email confirmation for the order? It can take up to 24 hours (during normal business hours) for your order to be processed internally and for you to receive an email confirmation. If you still haven't received your order confirmation email, please check your junk folder or spam filter. If you don't locate it, please contact our office at (800) 373-5330 so we can ensure your order was received and processed. Can I make a correction or addition to my order after it's placed? Most orders are sent to our production dept. shortly after they're processed so it's generally impossible to make corrections or changes to the order. If you have just placed your order, and want to check if changing it is possible, please contact our office at (800) 373-5330 to discuss the options. You will receive email notifications with the status of your order throughout the production process. The emails begin when the order is processed and continue until the order is shipped. We accept the following: Credit cards: MasterCard, Visa, and American Express. Company or Personal Checks (Personal check must clear our bank prior to shipping.) On Account (Terms): Upon credit approval. Can I place an order and get billed later? Companies with approved credit applications may order from us on open account. To apply for an account please contact us or call (800) 373-5330. Credit normally takes 2-4 weeks to get established. Is my personal information and credit card protected on your website? Where can I check my order status? You can check the status of your order at anytime by visiting our Order Status page . How is the order shipped? From where does it ship from? Almost all orders ship via UPS. UPS charges an extra fee when shipping to residential addresses compared to Commercial addresses, therefore we suggest having your order shipped to your office in order to keep costs as slow as possible. Minimum shipping charge of $10.75 applies to all orders. Orders that are over 600 lbs., or are oversized such as commercial signs, will entail additional delivery fees by UPS. If you have a heavy or oversized order and require additional information or services (such as lift gate or inside delivery), please contact us for a customized shipping quote. Do you ship to Canada, Hawaii, or Alaska? Yes, we will gladly ship anywhere UPS delivers. Please contact a customer service representative to get a customized shipping quote. How long does it take for UPS to deliver to me? Click here for our printing & shipping guarantee. What if I need to return or exchange something I ordered? Returns can only be accepted on unused stock items (i.e. frames, stock riders, etc.). Unfortunately, we cannot accept returns on customized or printed items. Returns are only accepted within 30 days of original shipment or within 30 business days after an RMA # has been issued. Products must be in "like new" condition when returned (i.e. frames and stakes that have been put into the ground are not accepted back). A 15% restocking fee may apply for returned products. Any refunds / credits due will be issued once the original item(s) have been returned, inspected, and restocked. My order is damaged, what do I do? If the product is damaged and / or contains manufacturing defects when you receive your order, please contact our office at (800) 373-5330. We will determine the cause of the damage or defect and replace the items ASAP. What type of paper are the cards printed on? Our standard business cards are printed on 14-point stock, which is equivalent to 100lb paper, either in matte (flat) or gloss finish. Are your cards printed on both sides? If you like, yes. When ordering, you can chose between a single-sided or double-sided card (additional charges may apply). What is a "full bleed"? Can my business cards be printed that way? The very edges of a document are called the "bleed area." A "full bleed" prevents an unwanted white border from showing at the edge of your card. To print full bleed, your design file should extend any background colors or design elements all the way to the edge. And yes, we're happy to print your cards "full bleed." Can my business cards have rounded corners? Yes, though an additional fee may apply. Can my cards have a gloss finish? How do I order my business cards from Oakley? You may order online at http://www.oakleysign.com, or contact our customer service department at 800-373-5330. Do you have every font? While we have thousands of fonts in our library, it is always best to convert the text to outlines. Text can be converted to curves (paths) in some graphics programs. This will fix upload errors that result when fonts are not embedded in your file. Following these easy steps will help ensure that your text prints clearly. How do I convert fonts to outlines in Adobe Illustrator? Text now has a blue outline. Save a copy of the file and use it for your artwork upload. What file types do you accept for artwork? What are the print specifications for photos? Photos? Any image you plan to use must be saved at approximately 300 dpi (dots per inch) at 100% output size for the very best printing results. It's helpful to know that shrinking an image on a product will increase its resolution. For example, an image captured at 600 x 900 pixels has 150-dpi at 4" x 6". However, it can be printed at 300-dpi by reducing its dimensions on the product to 2" x 3". How do I send you my custom logo, photo, or artwork? During the order process, you will be able to upload your custom artwork, logo, or photo. Do you have a template that I can use to design my own business card? Why are there trim lines within the templates? Trim lines are the finished size of the document. The document is cut close to the trim line, but because of the mechanical tolerances involved in printing, the actual cut can happen anywhere between the bleeds and the safe margin. This is why it is important to keep your text and important images within the safe margin. What's the difference between "Full Bleed," "Trim Size" and "Safe Zone"? Full bleed means the artwork on the card runs all the way to the edge of the card. There is no border or margin around the artwork. The "bleed" is the region of the unfinished card which is trimmed off. Any photos, colored background or images you want to continue to the very edge of your card must continue past the trim line (red line) by at least 1mm on all sides. We do not recommend graphic borders on the card, as small shifts during the cutting process may make the borders appear uneven. All files should be prepared at full bleed dimensions. Trim size is the actual size of your business card. Once printed, the unfinished product is cut down to final dimensions (trim size). The Safe Zone is the area which is guaranteed not to be trimmed. Put all essential information within the Safe Zone. Anything outside of the safe zone risks being lost or partially removed when the card is trimmed. Should I create my document at Full Bleed or Trim Size? When to create your document at the full bleed size: If you are working in an illustration program (such as Adobe Illustrator or Corel Draw) or a photo editing program (Such as Adobe Photoshop or Corel Photo-Paint), we recommend that you create your document at the full bleed size. This will prevent any white edges from showing at the borders after the final product is trimmed. When to create your document at the trim size: If you are working in a layout program (such as QuarkXPress or Adobe InDesign) we recommend that you create your document at the trim size and include the specified amount of bleed for your product (.137"). When you export your document as a PDF for upload, make sure to include the bleed in your output settings so that the final upload PDF document is at the full bleed size for your product. Do I need to make sure that the aspect ratio of my custom design is the same as the templates provided? Yes. If your image's aspect ratio is not equal to the aspect ratio of our documents, your image may appear stretched or distorted when it's scaled to fit. The aspect ratio of your image can be determined by dividing the image's width by its height. What is resolution and what resolution should my document be the best quality printing? Resolution refers to the number of dots per inch (dpi), or the amount of detail the image has. Most documents prepared for upload should be 300 dpi at 100% of the final print size. A higher resolution will create a larger file and longer upload time. Which color mode should I use? RGB or CMYK? Your document should be created in CMYK mode so that the colors that you see on the screen most closely match the final printed product. If you create your document in RGB, the colors in your printed product may vary slightly. Many of the bright values produced by your monitor cannot be reproduced in print. CMYK (Cyan, Magenta, Yellow and Black) are the colors used in the printing process, whereas RGB (Red, Green and Blue) are the colors used by screen displays such as your monitor. Please note that JPEG files are almost always in RGB. What kind of images can I provide? You may create printed products on our web site using digitized images from a variety of sources. Your designs, photos and images can come from a digital camera, scanner, or the Web. Please note: Any image you plan to use must be saved at approximately 300-dpi at 100% output size for the very best printing results. It's helpful to know that shrinking an image on a product will increase its resolution. For example, an image captured at 600 x 900 pixels has 150-dpi at 4" x 6". However, it can be printed at 300-dpi by reducing its dimensions on the product to 2" x 3". If you wish to use images from a digital camera, make sure the camera is set at a high enough resolution to result in 300 DPI at the intended photo print size. Most cameras have various settings for resolutions. The highest resolution for your camera depends on how many megapixels it has. You cannot increase the resolution of a photo after it is taken, except by reducing its printed dimensions (after you upload the image). Be careful when cropping a photo after it is taken. Cropping will reduce the number of pixels in the final image. Like a digital camera, a scanner must be set to the proper resolution before image capture. Many scanners default to 150-dpi (or spi). Set your scanner's resolution so that it results in 300-dpi at the image's final print size. 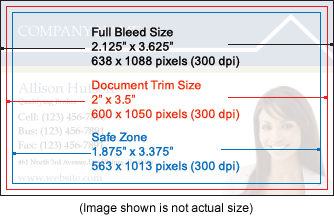 If your resulting scanned image is smaller than the recommended size or has less dpi than you need, you should either rescan your original at a higher resolution, or use the image for a smaller printed area. Images found on the web are typically at a resolution of 72-dpi. This resolution is much too low for quality printing. In addition, most images on the web are protected by copyright laws. For these reasons, we do not recommend using images from the web. Why does my proof look like the image is blurry? This could be as a result of a Raster image being provided instead of a Vector Image. Vector images use mathematical equations to define each component of an image. This allows vector images to retain their high-quality at any size. When possible, use vector graphics created in a desktop publishing program. A raster image is composed of a collection of tiny dots called pixels. When these pixels are small, and placed close together, they fool the eye into forming a single image. Raster images work well when subtle gradations of color are necessary. Because they contain a fixed number of pixels, a major disadvantage of raster images is that their quality suffers when they are enlarged or otherwise transformed. They are also large in file size. How do I get my company listed on your website? I see "Free Help for Real Estate Agents" on the website. What is that? Oakley Signs & Graphics publishes FREE original eBooks, webinars, and online courses for real estate agents in order to help them succeed. Learn more about our "Free Help for Real Estate Agents" at www.FHFREA.org. Does Oakley Signs & Graphics offer a printed product catalog? No. We could do what our competition does, and print thick product catalogs for tens of thousands of agents. But is this responsible? No, and here's why: Product catalogs consume natural resources, indirectly contribute to the global climate problem, and clutter mailboxes and filing systems. Not to mention, pricing and product information becomes outdated quickly. A recent in-house customer survey revealed over 89% of buyers don't use print catalogs to shop. What makes Oakley different from other companies? How about we just give you the facts and you decide. Click here to learn more.